Fish and Cruise layout is perfect for the whole family! If you don't need the fishing model, there is still plenty of seating for everyone! This is by far the fanciest fishing tritoon we have ever seen. The FCR or fish n' cruise layout satisfies both sides of the boating family with a fully functional fishing area in the aft and a full cruise layout fore and midship. 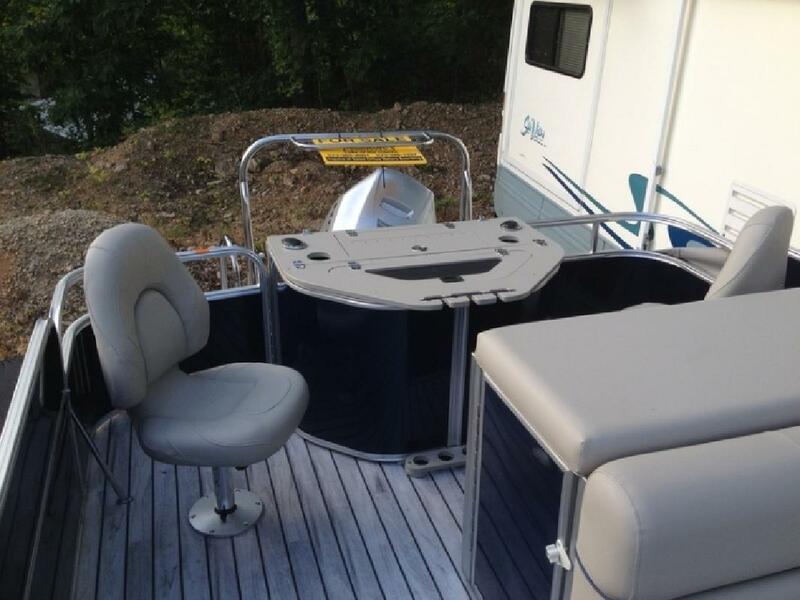 No expense was spared in outfitting this boat with options, it even has the vinyl teak flooring, no carpet to worry about getting dirty or fussing with power washer to clean and leaving uncovered to dry completely! For the fishing lovers, there is a console that contains live well, rod holders, tackleboxes and this boat was rigged with the upgraded centric fishing chairs, so comfortable. Lots of bells and whistles at the dash, upgraded Humminbird fish finder and depthfinder, dual battery with switch and 120v charging system. We keep triton trailers in stock for boats of all sizes, light and heavy duty. Call your friendly sales person today to schedule a showing on this boat.